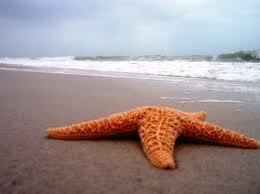 Learning How to Dance in the Rain ....: Throw a starfish !!!!! Yesterday was the girls school carnival. They were desperate for me to go with them - so I did. Mum and I took them to enjoy all the fun of the fair. I was tired before we even got there - so spent the time moving from seat to seat watching as our youngest went on all manner of stomach churning rides!! They had a great time on all the rides , sugarloading with show bags etc. it was great to see them having fun. Today however I am paying the price for being out and about!! The fatigue is quite consuming at the moment - i feel as if the life has been sucked out of me. I spent most of the day lying on my bed and the sofa - just unable to action anything at all today. The girls were tired too from yesterdays activities so we just relaxed at home. Miss C got a second wind of course but the joy of living on acerage is she had a great time starting a treehouse and B put in some steps for easier access!! She was delighted!! Chokes you up to hear that - she is such a tender hearted child. I am so proud of her and her sister - the way they are walking through this with us. It has been a tough road with unexpected twists and turns along the way- it has been a relief to see Miss C more like her old self . She has had to face challenges at 9 in these last months that even we as adults find difficult - and yet even in the midst of this she has come through. Her older sister amazes me how much she is growing up - 13 and yet so mature and wise in her outlook on life!! This afternoon we watched the movie Living Proof. It is a movie about the discovery and development of Herceptin. I had seen it before being diagnosed with breast cancer - but it was quite different watching it today now that I am actually on that drug myself!! What an incredible story of 1 mans perserverance and belief in a new way to treat breast cancer. It was 12 years before the drug was developed and then approved by the FDA. interestingly enough it was Revlon that donated over $2 million to fund Dr. Slamons research and has since helped raise over $65 million to aid and support Breast cancer research. Makes you want to run out and buy their products doesnt it!! 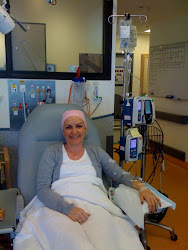 Now Herceptin is saving women all over the world who previously had no hope of any other option! I found myself sobbing through near the end - just touched so deeply how this man Dennis Slamon sacrificed so much of his own life so that he could make a difference in the lives of so many women - quite inspiring! It reminded me of that tale of the starfish. 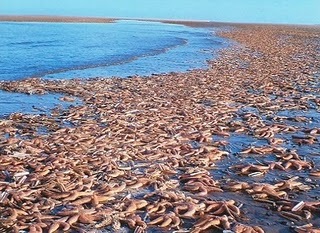 A man was waking along a beach and saw 100's of starfish that had been washed up on the beach. further ahead he saw a young boy throwing starfish back into the sea one by one. I am not sure that I have recalled this story correctly but I hope that you get the jist! One person can make a difference - even if it only affects one other surely it is worth it!! Or perhaps it will affect 1000's like Dr Dennis Slamon. We all have the ability to do something positive in our world - isn't that exciting that we can make that difference!